So dominant. But look at the other satellite yamaha riders. Rossi is fourth fastest yamaha. From having no answer to a succession of preseason woes, Scott Redding's recent turnaround has been quite remarkable, with the Englishman topping the second MotoGP free practice session at Losail. Building on a solid final winter test, Redding has been strong throughout the first weekend of the year, and fitted soft front and rear tyres to end FP2 0.1s up on fellow Ducati rider Andrea Dovizioso. After opting against the fitting of soft compounds on Thursday, the Italian produced a quick late run that was good enough to place second on the time sheets, and crucially, get inside the top overall free practice top ten. Thankfully, the 3.3-mile circuit had dried out by the time the session got underway after a colossal morning shower had soaked the track. Maverick Viñales soon showed grip wasn't a massive issue by lapping in the low 1m 55s early on. However, the sensation of winter testing soon found himself in trouble. Lapping just ahead of team-mate Valentino Rossi, Viñales entered turn four marginally off line. 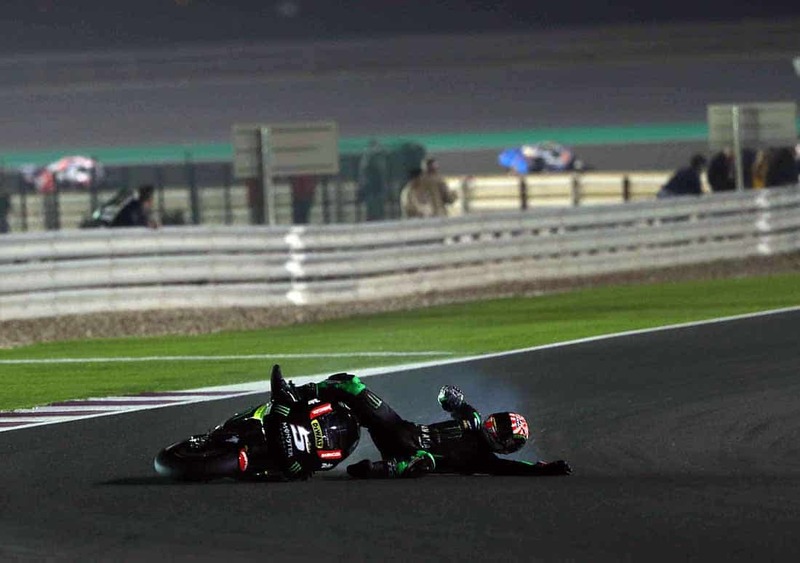 The precarious nature when going off line was evident as the M1 front tucked, leaving Viñales sliding on his back, contemplating a first fall of 2017. As such, he fell down the order in FP2, ending the 45 minutes in fifth, behind both Tech 3 Yamahas. It is quickly becoming commonplace to see Jonas Folger's name at the front, and again, the German was in the mix, ending a fantastic third. He was backed up by fellow rookie Johann Zarco, who was just 0.062s slower. Their stunning performances once again had Rossi (sixth) in the unfortunate position as the slowest Yamaha, after fitting soft tyres to improve his own precarious situation. Alvaro Bautista was a solid seventh, ahead of Jorge Lorenzo, whose body language conveyed a man with frustration levels rising by the minute. The Majorcan was more than half a second off the quickest time and skulked out of the garage as soon as he returned. Like Viñales, Marquez didn't fit soft rubber – believed to be worth at least half a second – and as a result finished the session ninth. Not to worry. He remains second on the combined free practice time sheets, behind Viñales, thanks to his time in FP1. Aleix Espargaro rounded out the top ten, with Danilo Petrucci, Cal Crutchlow and Jack Miller closely following. Other than Viñales and Marquez, Dani Pedrosa (19th) was the only other top ten rider that didn't improve his quickest time. Pedrosa remains fifth on the combined time sheets. What a shake up. Two rookies and Vinales leading all the former "aliens." Makes you wonder if Spies was still in the mix where he'd be. Lorenzo is in for a LOOOONG season. FP 3 in the books, Vinales back on top, Rossi, 13th but Rossi managed to stay in top 10 based upon combined times so he stays in the Qualifying 2, without having to work through qualifing 1. Comments below time tables. "boss, should we add/plan a drainage system for the track ... it does rain here sometimes"
"nah ... not necessary ... on the dates, motogp want to race here, it never rained heavily yet." If it's a wet race, there might be some significant attrition. Fookin' hell! What a race! Maybe it's because I've been anticipating the start of the season this year more because of all the shuffling in the teams but that was a great race. You think Ducati is having second thoughts about signing Lorenzo? Vinales is calm, collected, smoooth...a faster version of Lorenzo. And that's a lethal combination. What can you say about Rossi that hasn't already been said. He's what, 17 years older than Vinales? Capirossi, long since retired and the current safety director, used to race with Rossi. Poor Dovi ... always the bridesmaid, never the bride (as some commentator said). 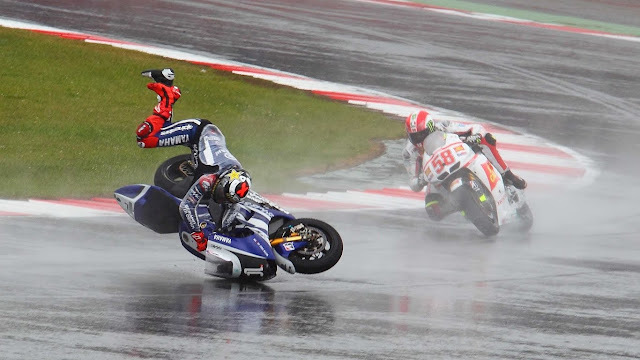 And Zarco...man, one rookie mistake and crash! Otherwise, the race would have been even more thrilling. Can you imagine if Zarco and Vinales were fighting for the win? Zarco was whaling Vinales and everbody else for quite a few laps, it looked like it was his race to lose. Vinales and everybody else were hoping Zarco made a mistake. He did. I was surprised Iannone crashed, that was a battle. Rossi finishing 3rd was great. His starting position sucked. Got nicked at the start and dragged his camera the whole race. Bet the fluttering of that sucked at 200MPH down the straight. That was a great race! In the post race interview Rossi said his body can't keep up with these kids and he was happy for his result. To be still on the podium and ever a threat to win at his age is a testament to his amazing skill and knowledge. Lorenzo seems so fragile. If the bike doesn't suit him, or his visor fogs a bit, or the phase of the moon is off, he's just not at all competitive. Which JLo will show up for any given race is anybody's guess. I have to admit to pulling for Zarco to hang on to the tail of the tiger. That kid will be fun to watch this season. Great result for Aprilia. They were congratulating themselves like they had won the race. It'll be interesting to see if KTM can come along and get competitive. Suzuki sure didn't waste any time getting back in the podium hunt. "since my return to Yamaha, i never really started the year with the target of being the champion. my target is always to win as many races as possible and be competitive." i was like "whaaaaaaaaaaaaaaaaaaaa .??" That is a dated photo with Simoncelli in the frame!! Folger and Zarco are on the 2016 bike. A bike that benefited from a whole season of development. By two of the best. I think Rossi even hinted he'd rather continue developing the 2016 but yamaha wants him to ride the 2017. The bike is DIALED IN. But credit where credit is due. Zarco rode it hard. Yes but unless I'm mistaken, the wings on the 16 bikes are not permitted in the 17 series.